Alan Geoffrey Page, (16 May 1920 – 3 August 2000), known as Geoffrey Page, was a British flying ace of the Second World War, and a founding member of the Guinea Pig Club. 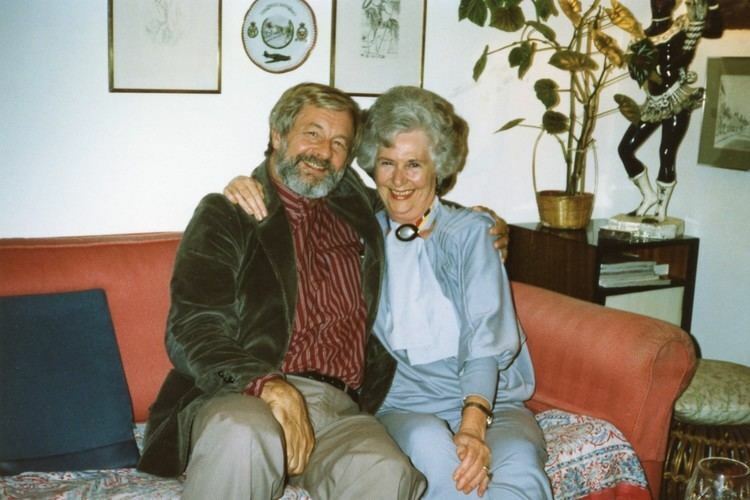 Page was born on 16 May 1920 in Boxmoor, England. His parents divorced when he was young. Page developed an early interest in aviation, perhaps not surprisingly as he had an uncle who flew in the First World War and another was the aircraft manufacturer, Sir Frederick Handley Page. Page was educated at Dean Close School, Cheltenham, and later studied Engineering at Imperial College, where he took advantage of the free Royal Air Force flying training available, and joined the University Air Squadron at Northolt. 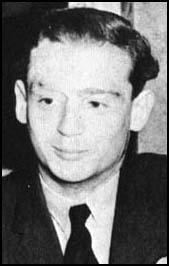 Two weeks after the outbreak of the Second World War, Page received his call-up papers and joined the RAF with the rank of acting pilot officer. After advanced training at Cranwell, Page was assessed as "exceptional" and assigned, against his wishes, to a flying instructor's role. However, in May 1940 he received a posting to No. 66 Squadron RAF, flying Spitfires. This posting was a blunder by the RAF, and Page was almost immediately re-posted to No. 56 Squadron RAF to fly Hawker Hurricanes. On 13 July Page claimed an "He 113" shot down (probably a Bf 109, as the He 113 never saw action) and on 20 July claimed a third share in a reconnaissance Junkers Ju 88 of 4(F)/122, the crew becoming POWs. He next downed an Junkers Ju 87 of StG. 1 off Dover on 25 July. He was shot down on 12 August 1940 during the Battle of Britain. Flying behind his commanding officer, attacking a large formation of Dornier Do 17 bombers, Page's Hurricane (serial P2970) was hit and caught fire. The fuel tank in front of him spewed burning high-octane fuel into the cockpit, covering Page. His uncovered hands and face were so badly burnt that as he descended in his parachute, he could smell his own flesh burning. After being picked up from the icy sea in near-mortal agony, he eventually arrived at the burns unit at Queen Victoria Hospital in East Grinstead, where the pioneering plastic surgeon Sir Archibald MacIndoe was rebuilding the bodies of disfigured servicemen. Both of his hands were burnt down to the bone, and his head had swollen to about three times its normal size. Page had also sustained gunshot wounds to both legs. During his time in hospital, Page became a founding member of the Guinea Pig Club; Maclndoe himself was elected life president and Page was the first chairman. 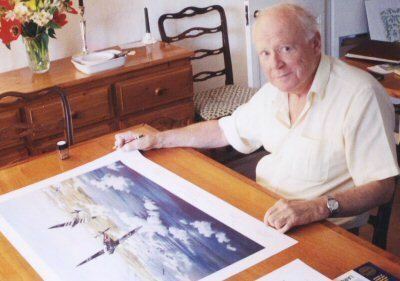 Owing to the burns sustained to both of his hands, it was deemed unlikely that Page would be able to fly again, but thanks to his hatred of the enemy, determined spirit, and MacIndoe's outstanding work during fifteen operations, Page succeeded in first gaining limited-flight permission and eventually achieved full operational status in 1942. 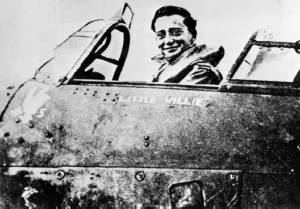 From that moment on, Page vowed to shoot down at least one enemy aircraft for each of the fifteen operations he had to endure. He joined No. 132 Squadron RAF as a supernumerary flight lieutenant, before volunteering for service in North Africa. The heat however had an effect on his skin grafts and he returned to the UK. A posting to the Air Fighting Development Unit (AFDU) at Wittering followed. There, flying the North American Mustang Mark I, he teamed up with Squadron Leader James MacLachlan, a pilot who, despite losing an arm over Malta in 1941, had like Page overcome his disability and returned to fly operationally. On one sortie south of Paris on 29 June 1943, the pair accounted for six enemy aircraft in ten minutes; three Hs 126 reconnaissance aircraft of JG 105, along with a Ju 88 of KG 6. Page was awarded the Distinguished Flying Cross for this action. On another such sortie on 18 July MacLachlan was shot down and killed. Page returned to hospital for more skin grafts. Later in the year he joined No. 122 Squadron RAF as a flight commander, before re-joining 132 Squadron in January 1944 as its commanding officer. On 29 April he led his squadron to strafe Deelen airfield in Gelderland and attacked a Bf 110 night fighter that was landing. Despite the odds the Bf 110 shot down two Spitfires before Page forced the aircraft down and destroyed it. This night fighter was flown by Experte Major Hans-Joachim Jabs of NJG 1, who survived and met with Page after the war. In September 1944 Page, now wing leader of No. 125 Wing RAF, crashed and was again injured, breaking a bone in his back. Page was again sent back to MacIndoe for a further operation, this time being informed that there was no chance of him ever flying again. By this time Page had already achieved his goal of 15 "kills" ( 10 solo, 5 shared, and 3 damaged) and had been decorated with the Distinguished Service Order and the Distinguished Flying Cross and Bar. He was later made an Officer of the Order of Orange Nassau by Wilhelmina, Queen of The Netherlands for his part in the Battle of Arnhem. The citation for his DSO read, in part: "Apart from his individual exploits, Wing Commander Page has infused the entire wing with his fighting spirit. Under his command 60 enemy aircraft have been destroyed." After Page was released from hospital in early 1945 he was sent to the United States to lecture on the RAF. While there Page became good friends with the actor Nigel Bruce and his wife Violet, who were later to become his parents-in-law. In the spring of 1945 Page underwent further surgery before being attached to Vickers Armstrong as a test pilot. He returned to England just as Germany surrendered, and took his discharge from the RAF in 1946 with the rank of wing commander. In 1946, Page married Pauline Bruce (daughter of British actor Nigel Bruce) in California with C. Aubrey Smith as his best man. He then commanded No. 64 Squadron RAF, flying the de Havilland Hornet fighter, and in 1947 was appointed personal assistant to the senior RAF officer at the UN military staff commission in New York. 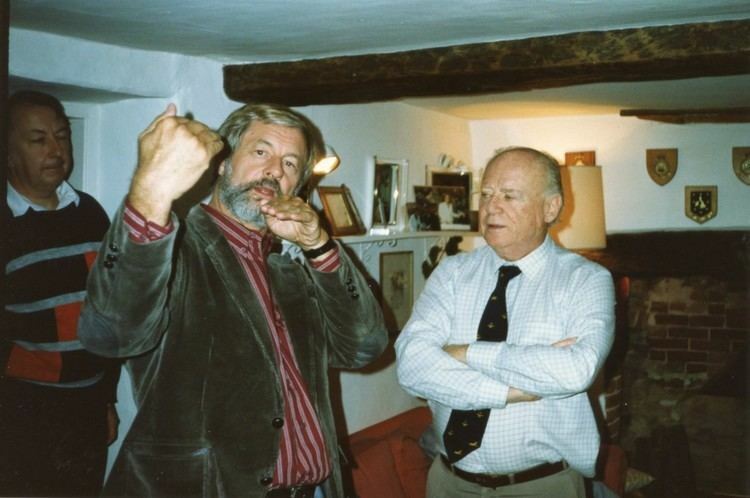 In 1948 he left the RAF and joined Vickers Armstrong as a sales executive and later became an international aviation consultant based in Switzerland. In retirement, as well as remaining the driving force of the Guinea Pig Club, Page founded the Battle of Britain Trust. This raised more than £1 million, with which the Battle of Britain memorial was erected overlooking the Straits of Dover, to commemorate those who kept Nazi Germany at bay. He was created an Officer of the Order of the British Empire in 1995 for his efforts. Page published his autobiography Tale of a Guinea Pig in 1981. A revised edition, retitled Shot Down in Flames, appeared in 1999. 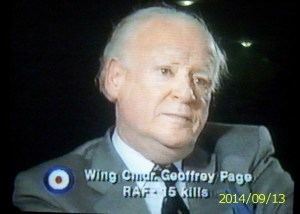 Geoffrey Page died on 3 August 2000, survived by his wife Pauline, his daughter Shelley and two sons, Nigel and Jamie.